And one thing I certainly do not like to do is rush into reviewing anything- which is probably why I would make a terrible beauty blogger who needs to post about The New Big Thing as soon as possible. So although these electronic cleansing / exfoiliating thingamajobs have been around for a while and I got mine ages ago I have only now gotten around to posting about it. 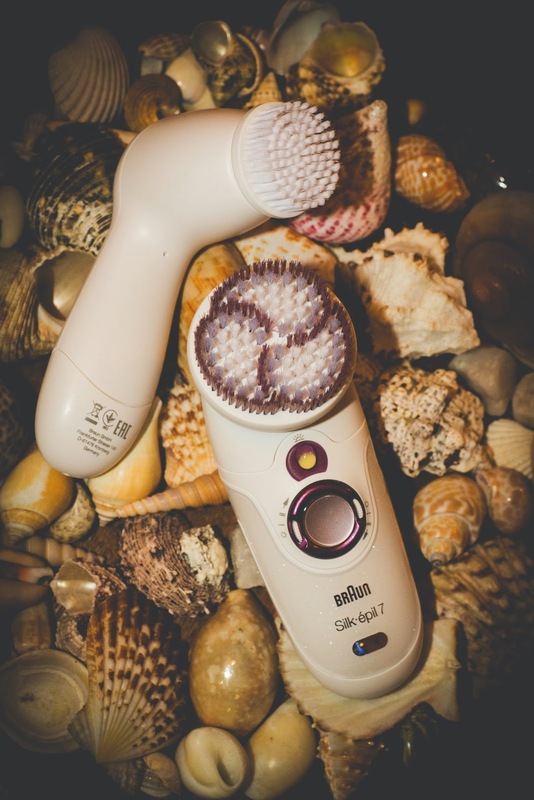 My review of the Braun Silk-epil SkinSpa 909 Review, or as Boots calls it: Braun Silk-epil SkinSpa 909 Care Set with body exfoliation and facial cleansing brushes. This costs £99.99 from Boots but this was gifted to me to review. In the box you get 2 machines, one for exfolitating your body (the larger one) and one for cleansing you face. Because these are 2 separate pieces of kit I'll review then separately before coming to an overall opinion at the bottom. I love the body exfoliator! This is the far better tool in my opinion, I use it with my normal moisturiser then buzz it all over the place. I aim to use it once a week but it is probably closer to once a month. This gives me a really good exfoliation and I can definitely feel the difference after using it. The other really good thing about this is that it's really easy to clean which is a big bonus. The tool designed for cleansing your face is not so great. The brushes are a lot softer as expected, and you are supposed to use it every day with your normal cleanser. However that would be waaaaaay way too much use for me! I use it once every month or so and that's enough! I have quite fragile skin because I suffer from acne (I wrote about it here recently) and have been on prescribed medication from the doctors. This has left my already sensitive skin very fragile, so any more regular use of the cleanser would probably destroy me. I would describe it as an exfoliator rather than a cleanser designed to remove make up. I would definitely not use it to remove make up because the brush would get super dirty- plus it's really tricky to clean. I don't know if it's because they are softer or what, but it's a real struggle! Overall I'm really torn about this product, I love the body scrubber and the face cleanser is pretty handy. However I don't think it's worth £100, but then again I don't know how much this technology would normally cost.